Generous chunks of dark and white chocolate make Byron Bay Cookies Gluten Free Triple Choc Fudge cookie Bar the ultimate indulgence. 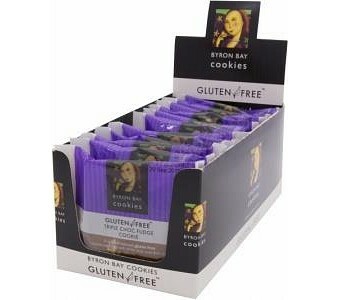 This individually wrapped biscuit is ideal to take to work or school. Ingredients: Gluten Free Flour [rice flour, tapioca starch, maize starch, soy flour, emulsifier (soy lecithin), thickeners (xanthan gum, guar gum, 464)], butter, dark compound chocolate (14%) [sugar, vegetable oil, cocoa powder, milk solids, emulsifiers (soy lecithin, 476, 492), salt, flavour], white compound chocolate (14%) [sugar, vegetable oil, milk solids, emulsifiers (soy lecithin, 492), flavour], sugar, cocoa powder (4%), glucose syrup (from maize), dextrose, fibre, maize cornflour, egg, skim milk powder, soy flour, raising agent (sodium bicarbonate), salt, flavour.